“In our mythology the sun is father of the Sámi, the earth our mother, and the god of wind brought them together. We are the children of their progeny and without the goodwill of the god of wind we are lost and, our reind eer flee; with his help we reach our quarry. The same is true of our land without which we are nothing. Representatives of larger countries who refer to our land as theirs, and who speak of the lakes and ri sssas resources of the state to be optimally exploited, have forgotten that we who lived here for thousands of years, have never left a trace of our passage, nor have we ever sold this land. When the last Ice Age peaked about 20,000 years ago the first inhabitants settled in the Arctic, and by the end of the ice age, 10,000 years ago, the area the Sámi call Sapmi today began to be inhabited. The first settlements were in coastal areas. Later, people moved inland. For several thousand years the population of Fennoscandia lived as hunters, fishers, and food- gatherers. Four thousand years ago or thereabouts the coastal dwellers were becoming sedentary farmers, and developing their economic contacts and language Southwards. They began to assimilate Scandinavian traits, culture, and identity. Those who continued to live non-sedentary, nomadic lives maintained the old languages and culture, as well as their contacts with the East. Archaeologists, for example have found ceramic and bronze objects, dating from 1500 BC similar in design and decoration to objects found in Russia and Mongolia. The two ways of life led to the creation of two different identities, socially, ethnically, and ideologically. By the beginning of the Christian Era this division was complete. The hunter-fishers now had a Sámi identity. By the 17th century reindeer-herding had become the principle livelihood and source of income. 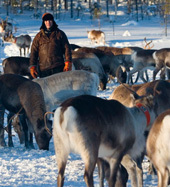 Administrative and social cooperation among the reindeer herders was established through the Sijdda social system . The Sijdda was composed of a number of families often related to each other, and managed by the family head. Together they used the land, the lakes and the sea, hunting grounds and fishing waters. Seasonal migrations were undertaken to best utilise the different resources. Salmon fishing, beaver and wild reindeer hunting for example were undertaken jointly, and all in the Sijdda got their share. The Sijdda also had its own tribunal, and of course consultations took place between different Sijdda groups. As a result of colonisation the early territorial boundaries were eliminated, and Sapmi was divided according to the interests of the Scandinavian nation-states. In 1751 Norway and Sweden established the borders between their kingdoms for example. They did not take into account the Sámi boundaries except with the “Lapp Codicil” which established that the Sámi would have the right to continue their seasonal migrations, and would no longer be forced to pay tax to more than one kingdom. At certain times the Sámi had paid taxes to three different states. Sapmi has a truly varied landscape. In the East it stretches from the White Sea; in the North to the Barents Sea; in the West to the Atlantic Ocean, and in the South to the Baltic. Both the Atlantic and the Barents are rich in fish. At low altitude pine and spruce forests grow, and at a higher altitude birch forests. A long high mountain chain, the Fjåll, runs North to South; large portions lack trees, but the area has abundant lakes, rivers and marshes. The Gulf stream gives the North of Scandinavia a warmer climate than areas of similar latitude in Siberia and Canada, but the winters are still harsh. People, animals and vegetation have had to adjust to the cold and the snow. 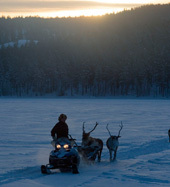 The Sámi survive thanks to fire, skis and reindeer! 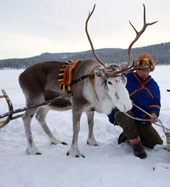 The Sámi, one of the great indigenous peoples of the Arctic, are a people who have been divided between four nations. The total number of Sámi is about 70,000, of which Norway with the largest population has approx 40,000, Sweden 20,000, Finland approx 7500, and Russia perhaps 2500. The territory in which the Sámi live is called Sapmi by them, and since 1986 has had a common Sámi flag. A language belonging to the Finno-Ugrian branch of the Uralic languages, and is linguistically related to Finnish, Estonian, Hungarian, and Turkish. The language is particularly rich in words describing nature, fauna, natural formations, and snow of course! and structure from anything else in Scandinavia, was not originally meant as entertainment. Instead it was a way for the singer to come close to his or her thoughts. To Yoik is a way of remembering (Johan Turi) - where the power of song is rooted in the potency of place, and where language is inseparable from song and story. The singer is bound to the land, and there is a correspondence between the voice and the animate landscape. The Yoik structures carry, in a sense, the memory of how to orient in that landscape, where local earth is symbolic as the “matrix of meaning” (David Abram) and where displacement from, or destruction of that context, is genuinely life-annihilating. Yoik can be almost like prayer, and earlier was part of the ceremonies of the Noajdde (Shaman) through which he or she could enter trance and travel to other worlds. The Yoik exists, and flourishes again, although it was forbidden for many years. It is being redeveloped by new generations. Duodji is the Sámi word for handicraft, which forms another important part of Sámi culture. The materials used - reindeer antlers, hides, furs, sinews, bark, roots, and growths on tree trunks - have been employed by the Sámis for hundreds of years, even if , with emphasis on economics, price, and competition, many such materials are no longer saved and respected. The essential characteristic of such handicraft work was that the materials were fully utilised, and that nothing was wasted. Whether making knives, sheaths, boxes out of birchbark, a child’s cradle (Gietkka), a felt Gakti (smock), boots, or the Shaman’s drum which had to produce a clear, clean sound, the selection of materials was paramount. Even the needles made from horn, and the thread from sinew, came from the reindeer.